New cardinals and archbishops are seen as Pope Francis celebrates Mass marking the feast of Sts Peter and Paul in St Peter’s Square at the Vatican on 29 June. At the conclusion of the Mass, Pope Francis presented palliums in boxes to dozens of new archbishops from around the world. Photo: CNS/Paul Haring. God wants his disciples to bring his mercy and love to everyone, everywhere on earth, which means it may cost them their “good name,” comfort and their life, Pope Francis said on the feast of Sts Peter and Paul. Following Christ requires “that we open our hearts to the Father and to all those with whom he has wished to identify,” particularly the downtrodden, the lost and the wounded, “in the sure knowledge that he will never abandon his people,” he said during a Mass in St Peter’s Square on 29 June. Both new and old cardinals as well as 30 archbishops appointed over the course of the past year were invited to be in Rome to concelebrate the feast day Mass with Pope Francis. The archbishops came from 18 countries, the majority coming from Latin America and others from Africa, Asia and Europe. Pope Francis presents a wooden box containing a pallium to a new archbishop during a Mass marking the feast of Sts Peter and Paul in St Peter’s Square at the Vatican on 29 June. Photo: CNS/Paul Haring. As has become standard practice, Pope Francis did not confer the pallium on new archbishops during the liturgy, but rather, blessed the palliums after they had been brought up from the crypt above the tomb of St Peter. As each archbishop approached him by the altar, the Holy Father handed each one a small wooden box tied with a thin gold ribbon. The actual imposition of the woollen band will take place in the archbishop’s archdiocese in the presence of his faithful and bishops from neighbouring dioceses. The pallium is a woollen band that symbolises an archbishop’s unity with the Pope and his authority and responsibility to care for the flock the Pope has entrusted to him. Addressing the cardinals and archbishops during his homily, Pope Francis spoke about what Peter teaches them about the life and risks of being Christ’s disciple. Pope Francis greets a man during a dinner for the poor hosted by new Cardinal Konrad Krajewski, the papal almoner, right, in the dining hall at the Vatican on 29 June 29. Photo: CNS/Gianna Lasilli. “Thinking that he is defending God’s rights, Peter, without realising it, becomes the Lord’s enemy; Jesus calls him ‘Satan. '” he said. “Like Peter, we as a church will always be tempted to hear those ‘whisperings’ of the evil one, which will become a stumbling stone for the mission,” Pope Francis said. 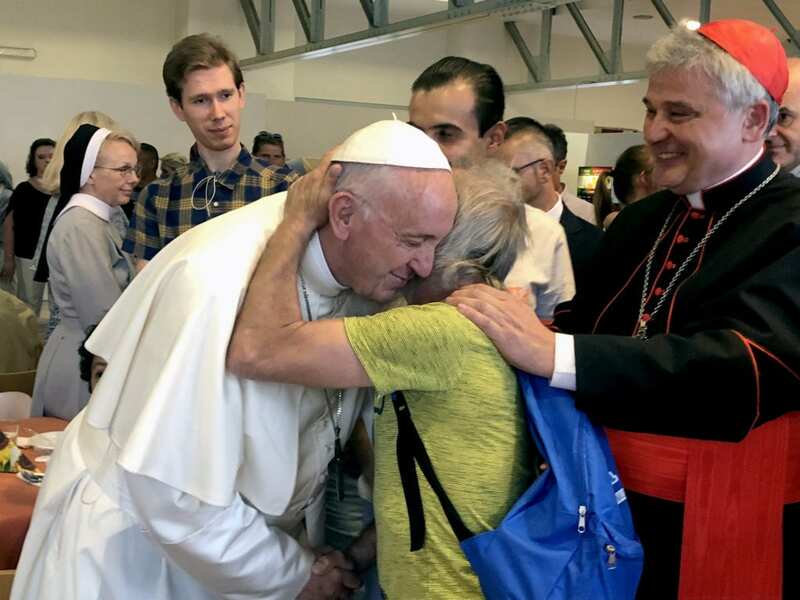 Do not be Christians who keep “a prudent distance from the Lord’s wounds,” because Jesus touches human misery and “he asks us to join him in touching the suffering flesh of others,” Pope Francis told those assembled.